Solomon’s temple stood in Jerusalem for almost 400 years. It was the crown jewel of Jerusalem and the center of worship to the Lord. Understanding the significance of its location, history, and design can greatly add to one’s reverence for one of the most holy places in the world. 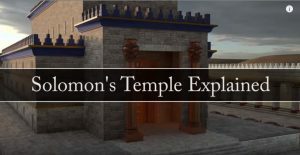 Since we will be studying Solomon’s temple in Sunday School this year, Daniel Smith from Messages of Christ created a video to help us understand the symbolism, history, and location of Solomon’s temple and visualize how the temple functioned. Unfortunately, that link is broken and I only get a message that the video may have been removed or moved to a different location. We had this lesson Sunday last and would actually have been interesting to have in class. The link works for me. Try it again.